Located in the centre of Ajaccio, a few metres from the harbour, this air-conditioned hotel offers a traditional restaurant and a terrace. Auberge du cheval blanc is only 300 metres from Saint-François Beach. The rooms at Auberge du cheval blanc have a coffee machine, a cable TV and a private bathroom with free toiletries and hairdryer. Guests can go to the local market every day, 200 metres away. Grocers can be found within 600 metres. Casa Buonaparte, the property where Napoleon Bonaparte was born is 100 metres. 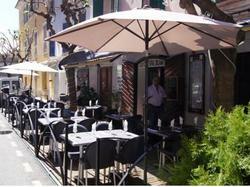 The hotel is situated 6 km from the Ajaccio Napoleon Bonaparte Airport. The rooms have a coffee machine, a cable TV and a private bathroom with free toiletries and hairdryer.